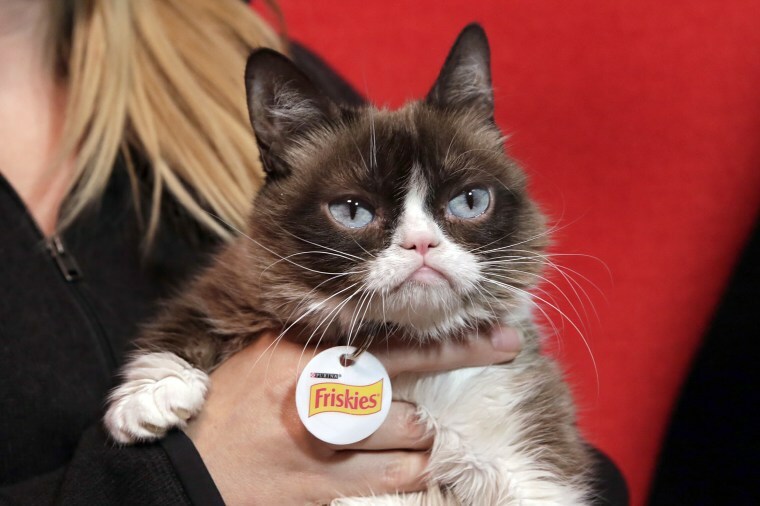 SANTA ANA, Calif. — It still won't make her smile, but Grumpy Cat has won some scratch. She signed on for the cat to endorse a "Grumpy Cat Grumpuccino," but the company subsequently used the cat's image to help sell other products, which an eight-person jury on Monday found was unauthorized. “Ironically, while the world-famous feline Grumpy Cat and her valuable brand are most often invoked in a tongue-and-cheek fashion, Defendants’ despicable misconduct here has actually given Grumpy Cat and her owners something to be grumpy about,” the complaint obtained by The Washington Post stated. David Jonelis, the attorney for Grumpy Cat Limited, told Courthouse News the verdict was a "complete victory." “Grumpy Cat feels vindicated and feels the jury reached a just verdict," he said. Grumpy Cat, whose dwarfism and underbite give her the permanent frown she's famous for, became an online phenomenon-turned-merchandising-machine after Bundesen first posted pictures of her in 2012.